During our Soul Sisters Getaway we worked on lots of fun projects like Tassel Necklaces, Funky Frames and Clipboards, and Cookie Decorating 101 along with the ever-popular activities of wine-drinking, junk food eating, and shopping. It's tough being a girl! 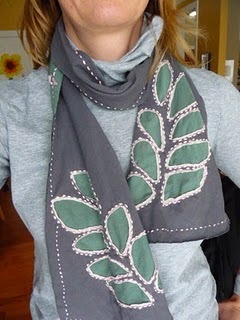 Joy planned our final project, Scarves inspired by Alabama Chanin's book, Alabama Studio Style. This book emphasizes sustainable, wearable art made from recycled and organic materials. Leafing through this book and Joy's materials inspired us all. Using t-shirts, scissors and embroidery thread we each created a great scarf using reverse applique method like the Layered Tee Tutorial I once blogged. 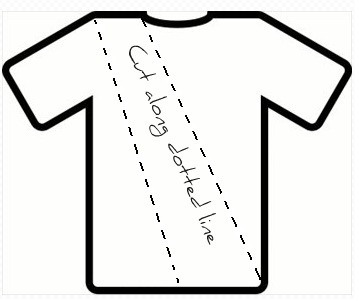 We cut two t-shirts (two different colors) the same way, then layered them together, shoulder seams facing in. Using chalk, we drew a simple pattern onto the top layer of our material. You can use a stencil or freehand this. Personally, I feel like this step was enhanced by wine and cheesecake...but maybe that's just me. Then we stitched, stitched, stitched! Stitch around the pattern using large stitches in a contrasting embroidery thread then cut out the center of the top layer, revealing the layer of fabric underneath. I swear every time we cut out those shapes it was a a big TA-DA!!! You can use your imagination when it comes to stitches, patterns, colors...Go crazy, girl! Come on, this is cool! Get to work raiding your Hubby's closet, I feel a Christmas gift coming on! Come on back tomorrow to link up with Tutorial Tuesday. It will be your turn to Teach Me Stuff! Too cute! I'm raiding the closets!!! Oh, yeah. My sister just asked for a nice scarf and now I have one I can make myself. Thanks for sharing this great project.! Very cute. I think my girl scout troop would love to do something like this. Really, really cute scarf! I love it! Love that! I took a class with Natalie Channin a while ago and got on a reverse applique binge for a while...it's died down but I can feel a new wave comin over!